Operational Training prepares the Army to meet such requirements. It consists of all training in field formations which are planned, coordinated and conducted under formation/unit arrangements. Individual training, sub-unit and unit training, collective training, field firing etc. all form part of operational training. The Indian Army's training cycle is normally on a yearly basis. The training year is from July to June. 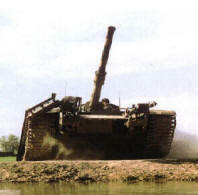 The armour units train during Annual Field firing practices carried out at select few ranges in the country. Amongst the Arms, Artillery has the maximum number of training facets already quantified. The Corps has a system of annual practice camps in vogue, which are assessed. Consequent to Individual training all infantry units not committed operationally go through a strict regimen of Annual Training Cycle wherein the Formation Commander lays down specific standards to be achieved. Over the years, the Corps of Engineers has evolved realistic planning data for execution of engineering tasks by units and subunits. For most engineer tasks, detailed target timings, under specified conditions, have been laid down. By and large, all combat engineer tasks lend themselves to be quantified, in terms of laid down timings. Each Signals Regiment exercises itself once every year to cover all aspects of communications. The thrust in the new millennium being on information Technology and Automation. All other Arms and Services have systems to assess subunit and unit training to varying degrees. Collective Training is conducted to weld individuals and teams into effective subunits and units, and to practice all echelons of command in their operational tasks. Collective Training also tests the mechanics of battle drills, battle procedures and signal communications on the ground. The performance of a unit and formation in collective training provides an insight into its training standards and the state of its combat preparedness. Training exercises in the Indian Army are organization of umpires, pooled from other units and formations.